Train movement through Sevoke bridge over the Teesta river was suspended because of rising water level even as rain continued to pummel many districts of north Bengal. 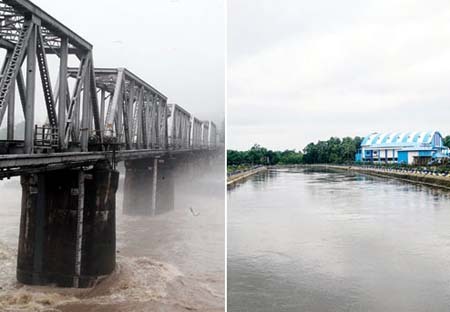 Water levels have increased in most rivers in north Bengal, particularly in the sub-Himalayan region, because of incessant rainfall in the hills and plains in the past couple of days. Unconfirmed reports suggested that Pillar VII of the Sevoke bridge had developed a crack, leading to halt in rail traffic. However, officials of the Northeast Frontier Railway (NFR) have denied that the bridge has developed a crack. "As a measure of abundant precaution, train movement over bridge No. 52 over Teesta river, between Bagracot and Sevoke, has been suspended temporarily as the river is in spate following very high rainfall in the catchment area," says a press release issued by P.J. Sharma, the chief public relation officer of NFR, this afternoon. The NFR said a few trains had been diverted via New Jalpaiguri-Raninagar Jalpaiguri-New Cooch Behar-Baneswar-Alipurduar Junction route, instead of New Jalpaiguri-Siliguri Junction-Alipurduar Junction route. Among the trains which were diverted were the 19709Up Jaipur-Kamakhya Kavi Guru Express, 13150 Down Alipurduar Junction-Sealdah Kanchankanya Express, 15484 Sikkim Mahananda Express and 15901 Up SBC-Dibrugarh Express. Over 10 local trains were cancelled and they included NJP-Alipurduar Junction Passenger, Siliguri Junction-Dinhata DEMU, Siliguri Junction-Dhubri Intercity Express, New Cooch Behar-Siliguri Junction DEMU, Alipurduar Junction-Siliguri Junction Intercity Express, Siliguri Junction-Bamanhat Passenger. "Even tomorrow, some local trains would be cancelled and a few might be short-terminated," an NFR source said. Asked why the train movement on the Sevoke bridge had been suspended, an NFR official said: "The water level is close to the danger mark. There is always a chance that the water level might increase further and touch the bridge. As the bridge's pillars are already under pressure from the turbulent water, the structure might be damaged if it has to hold a train's burden also. Further, if a pillar has already suffered damage, it will be visible only when the water recedes. It is always better to take precautions." He went on: "Train movement can only be allowed through the bridge after the water level goes down and a thorough inspection of the bridge is done by our technical experts. It is a routine practice to avoid any mishap." The bridge is 20km from Siliguri. As the rain continued to batter the region, more areas were submerged in Jalpaiguri town. Water from the Karala river spilled over and flooded ward 25 of the town. Around 200 families had to leave their homes last night. They have taken shelter on the bridge over the Karala and have been provided with relief. The body of Haridas Mondal, 32, a resident of Mundabusty in Jalpaiguri, was found in the Karala this morning. The body of Haridas Mondal, 32, a resident of Mundabusty in Jalpaiguri, was found in the Karala this morning. "Preliminary reports suggest that he was sitting on the bank of the Karala and catching fish. The water levels suddenly rose and he slipped into the river. Today early morning, his body was recovered in the downstream," an officer of Kotwali police station in Jalpaiguri said. Other than Jalpaiguri town, over 100 families residing in Champadanga and Basusuba areas, located on the left bank of the Teesta river, where there is no embankment, have moved to safer places as the water level has risen. Over 2,000 houses in Alipurduar and Jalpaiguri had already been marooned because of the rain. In the Dooars, the Hatinala stream that flows down from Bhutan and moves through Binnaguri under Dhupguri block flooded a number of localities in Binnaguri this morning. "Areas like SM Colony, Netajipara, Premnagar in Binnaguri were flooded by the Hati Nala. Even the premises of the local Hindi High School have been flooded," a block official said. Sumedha Pradhan, the additional district magistrate of Jalpaiguri, said she would speak to officials of the bordering districts of Bhutan, requesting them to inform in case there was heavy rain in the neighbouring country. "If we get information from Bhutan, we can take necessary steps and shift people. Such advance alert can also help us chalk out plans for relief and rescue," she said. Sources at India Meteorological Department said rains were likely to continue.